A collection of news groups is a short definition of Usenet. Initially, users posted only messages, often called articles or posts, which are distributed via Usenet servers. Collectively these posts are called news and they are categorized in news groups. The posts are kept only for a limited amount of time, retention time. In order to start reading and posting messages of files, you need an access program: a Usenet provider. Nowadays Usenet is mainly used as a file sharing service. 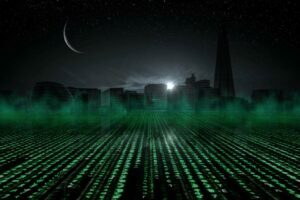 Free Usenet providers, a myth? As opposed to BitTorrent which uses P2P technology, Usenet is server based. When you use BitTorrent you download pieces of files from other users and at the same time, you also share pieces of the files with others. The BitTorrent files are not stored in one location but all files are stored in fragmented at all users. Usenet operated servers that hold all complete files as opposed to BitTorrent. This is safer and more reliable but operating servers costs money and therefore Usenet is usually a paid service. Only the Sun rises for free, some people say. 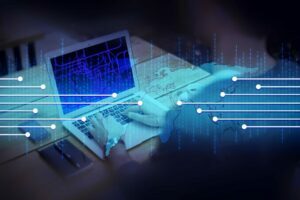 Although there are a few Usenet providers that are completely free, they are far from reliable, unstable and mostly slow. They usually have a limited amount of files, a short retention time and offer poor, but most likely no security. We do not recommend any of these services. All the best Usenet providers offer free trial periods. This is the best way to find out which provider suits your needs, without paying. You will get unlimited access and speed and will be able to really evaluate and appreciate this awesome service. Do you know which Usenet provider to pick? There is so much marketing, so many promises. What can you believe and which provider is actually worth trying? We have put together an overview for you with over two months worth of free premium Usenet. Click on “Test 14 days for free now” and finish step 2. Unlimited speed 250GB data and finish step 2. Does not matter which plan type you choose and finish step 2. 3 Day High-Speed (Plus) does NOT give you a free trial, all other plan types do and finish step 2. Add contact and payment info (Paypal, credit card, debit card). Huh, need to pay? No, the chosen amount for authorization is applied as ‘pending’, but is not charged. If you decide to continue using the provider beyond the 14-day trial period or download beyond the limit, you will be charged the amount of the plan that you chose. You then have 30 days on your new account (for monthly accounts). 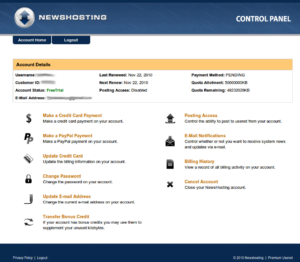 Data limits only apply to Newshosting, Easynews, and UsenetServer. In short, the free Usenet trial is free of charge, as the authorization is not charged if you cancel timely. Notice: Be aware that you pick a plan where “Free Trial” has a green check! Want the cheapest premium unlimited Usenet provider access? Cancel your free Usenet trial in time and sign up with a heavy discount on the UNLIMITED data/speed offers on your right. 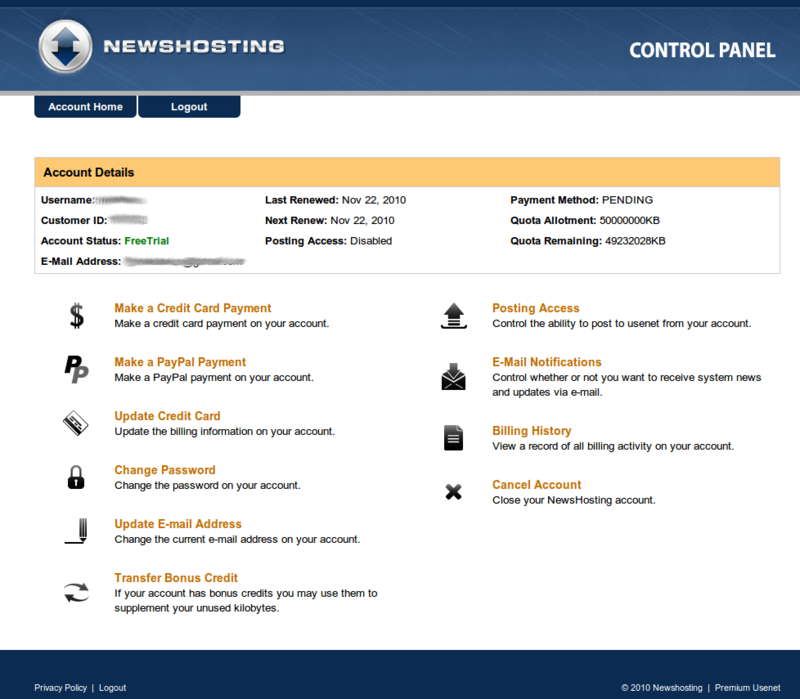 The Newshosting control panel screenshot below shows you that the amount is PENDING and not charged. Everything else speaks for itself, like remaining quota in KB. If you are still looking for a fully automated and great Usenet client for Windows, OSX, Linux, Unix or BSD, check out the Sabnzbd setup guide on Ubuntu Linux. This popular service is mainly used by file sharers. With the right provider and tools it is easy and very fast to download the files you are looking for. In combination with the Usenet provider you choose it is recommended to use an NZB search engine. There are many NZB sites that offer NZB searching. We have listed and ranked the best of 2017. XS News is a Dutch ‘Usenet access platform’ with over 200.000 news groups. They are an affordable service but the retention rate of 1.100 days is rather low. They offer unlimited speed with the top package, but because they only have servers in Europe, speed might not be that good outside of Europe. It is, however, a very secure service, offering free SSL to each subscriber. UseNeXT, based in Germany, is one of the biggest Usenet providers. They have worldwide coverage, high retention rates, and very good customer support They offer more than 100.000 news groups with 30 concurrent connections. With all packages, you get unlimited speed and the entry package is limited to 30 GB per month. 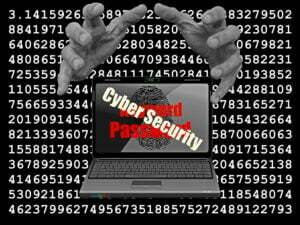 They also offer 256-bit SSL protection for secure downloading. At the end of your data limit, you can continue downloading at a lower speed or with the slower free of charge downloading. As a newcomer to Usenet Newshosting makes it easy to get started. You get an all-inclusive package including a very impressive interface and a 30GB data limit. Their retention rate is one of the highest and the standard 256-bit encryption provides great security. With the high-end package, you even get a free VPN service, which is a paid extra in the 2 lower packages. Easynews was launched in 1994 and is probably one of the oldest Usenet providers out there. With around one million users they are about the same size as UseNeXT. There interface is web-based which means you can access news groups from any device with a normal web browser. Such an interface set-up means you don’t have to install and configure a software application which often is third-party with other services. The more than 3000 days retention time is reserved for the high-end package with much lower retention with the other packages. UsenetServer is a popular Usenet provider. If you know how to handle NZB files it has a lot to offer for a reasonable price. However, the biggest shortfall for newbies is that it doesn’t have its own news reader. It is therefore not that easy to find content. It offers however unlimited Usenet access with fast download speeds. And besides the free SSL 256-bit encryption that all others offer UsenetServer also offers free VPN with the entry package.